Learn about corporate "speech" and other "rights" v. people's rights. And help put Americans before corporations. Former Exxon Mobil's CEO, Rex Tillerson, made $22.4 million in 2009. In 2017, Tillerson was replaced by Darren Woods. 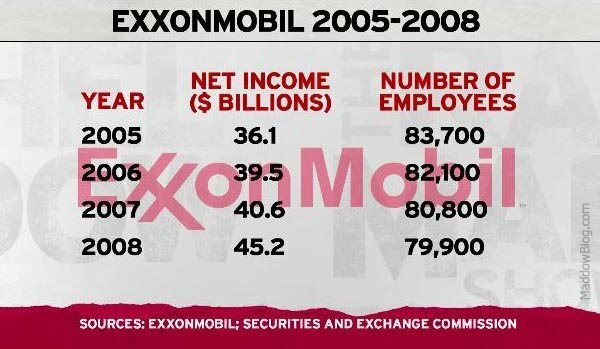 Access Exxon Mobil's corporate rap sheet compiled and written by Good Jobs First here. An Exxon lawyer wrote a draft of answers to a reporter's questions surrounding the nomination of Kathleen Hartnett White to head the White House's Council on Environmental Quality. According to HuffPo, this process "shows the fossil fuel industry’s enormous reach into the Trump administration." Hartnett White works for the Koch supported, State Policy Network member group, the Texas Public Policy Foundation (TPPF). Mark Greenblatt, the reporter, emailed questions to the White House directed specifically at President Trump. The White House press officers informed the council of the inquiry. Mario Loyola, the council’s associate director for regulatory reform and TPPF alum forwarded the email to Hartnett White. Hartnett White replied to that email saying "here are some sample responses that I like," with responses from Derek Seal. Seal's law firm currently represents Exxon Mobil. David Anderson of the Energy Policy Institute told HuffPo that "the emails illustrate the extent to which the Trump administration is willing to nominate someone who is a mouthpiece for polluters to a top environmental position.” Hartnett White's nomination was withdrawn from considersation in the following month. It was a "Chairman" level sponsor of 2011, 2013, and 2016 American Legislative Exchange Council Annual Conferences, which in 2010, equated to $50,000. It was a "Vice Chairman" level sponsor of the 2012, 2014, and 2015 ALEC Annual Conferences, which in 2010, equated to $25,000. Kevin Murphy, a public affairs executive, also represented Exxon on ALEC's corporate ("Private Enterprise") board in 2011. Exxon Mobil contributed $15,000 for ALEC's annual conference, $31,000 for general support, and $1,500 for undisclosed use. The amount totaled $47,500 in 2009. These contributions came in the form of membership dues, conference sponsorship, and general operating support, as well as funding for specific projects like the "Energy Sustainability Project." ALEC has issued "model legislation" or resolutions denying climate change, promoting climate change denial in schools, and supporting offshore drilling, among other bills. In a new filing to the IRS – adding to an active investigation prompted by a 2012 complaint that ALEC is operating as a corporate lobbying group while registered as a 501(c)(3) nonprofit charity – the watchdog organizations detail for the first time how Exxon has used ALEC as a key asset in its explicit campaign to sow uncertainty about climate science, undermine international climate treaties and block legislation to reduce emissions. While ALEC purports to spend zero dollars on lobbying, Exxon has deliberately used ALEC for the past two decades to advance its legislative goals concerning cap-and-trade policies, fracking, the Keystone Pipeline and the Obama Administration’s Clean Power Plan. CMD and Common Cause provided the IRS Whistleblower Office with extensive evidence obtained through open records requests, original research and public financial documents detailing intentional misuse of ALEC by the Exxon to advance legislation of direct benefit to the company. Over a 17-year period, Exxon and its foundation spent more than $1.7 million to finance lobbying activity by ALEC on legislation and public policies that benefit the corporation, while improperly and illegally claiming a tax deduction for those expenditures. See exxonsecrets.org for fact-sheets on funding recipients. Exxon's public tone on climate change has softened since Tillerson took the reins of the company at the beginning of 2006, replacing the often-combative Lee Raymond. Tillerson has said that nations should work toward a global policy to fight climate change and in 2006 [and again in 2007] the company stopped funding a handful of groups that were climate change skeptics. But Exxon continued to fund a further 28 groups which campaigned against climate science. And the Center for Science in the public Interest stated in June 2008, "Each group continued to receive Exxon funding in 2007 after the company’s first announcement that it would discontinue the payments. Exxon did not immediately return calls seeking comment on how serious it was in following through on its plans." . In 2011, the Global Warming Policy Foundation's website ran the headline "900+ Peer-Reviewed Papers Supporting Skepticism Of 'Man-Made' Global Warming (AGW) Alarm," listing more than 900 papers which, according to the GWPF, refute "concern relating to a negative environmental or socio-economic effect of AGW, usually exaggerated as catastrophic." However, a preliminary data analysis by the Carbon Brief revealed that nine of the ten most prolific authors cited have links to organisations funded by ExxonMobil, and the tenth has co-authored several papers with Exxon-funded contributors. The top ten contributors alone were responsible for 186 of the papers (over 20%) cited by the Global Warming Policy Foundation. Dr Sherwood Idso was the most cited academic on the list, having authored or co-authored 67 of the 938 papers, seven percent of the total. Idso is president of the Center for the Study of Carbon Dioxide and Global Change, a thinktank which has been funded by ExxonMobil. Idso has also been linked to the Information Council on the Environment ( ICE ), an energy industry PR campaign accused of "astroturfing". The second most cited is Dr Patrick Michaels - with 28 papers to his name. Michaels is a well known climate sceptic who has revealed that he receives around 40% of his funding from the oil industry. Third most cited is Agricultural scientist Dr Bruce Kimball - the list shows that all of his cited papers were co-authored with Dr Sherwood B Idso. Also included was Willie Soon, a senior scientist at the Exxon funded George C Marshall institute, and John Christy, also a Marshall Institute "expert." Ross McKitrick is a senior fellow at the Exxon funded Fraser institute and on the academic advisory board of the Global Warming Policy Foundation. Dr Indur Goklany is affiliated with the Exxon Funded thinktank the International Policy Network (US). Sallie Baliunas is listed by the Union of Concerned Scientists as being affiliated with nine different organisations who have all received funding from ExxonMobil, including the George C Marshall Institute. Richard Lindzen, a climate scientist and prominent sceptic, is a member of the Annapolis Center for Science-Based Public Policy, which has also received Exxon funding. The final name in the top 10 contributors - David Douglass - has written several papers with Singer, Christie and Michaels - six of the fifteen papers he authored on the list were written with Michaels, Singer or Christie. In 2010, the Walkley Foundation, the professional development arm of Australia's media union the Media Entertainment and Arts Alliance, chose Exxon Mobil as the Gold sponsor for its August 2010 annual conference. In July, there were reports on the Australian Broadcasting Corporation's PM program and News Corporation's The Australian that Exxon Mobil had broken its pledge not to fund climate skeptics. The Australian Centre for Independent Journalism (ACIJ) opposed the sponsorship and began a public petition  signed by journalists, environmentalists and academics asking the union to reconsider their agreement. Recognizing Indian Prime Minister Manmohan Singh's visit to Washington, in mid-July 2005 ExxonMobil ran a quarter-page ad on the op-ed page of New York Times headlined "Saving Tigers." According to Exxon's website, the company has given more than $9 million since 1995 to efforts to save endangered tigers. Exxon has claimed the tiger as its brand mascot since the 1930s. While "preserving the endangered Bengal tiger" did make its way in to an early State Department press release on the summit, India's nuclear industry, the global war on terrorism and foreign investment in India were the dominate themes of the meeting. The agreement to help India further develop its nuclear energy capacity is part of a larger U.S.-India Energy Dialogue that also includes an Oil and Gas Working Group that "will endeavor to strengthen mutual energy security and promote stable energy markets." Several NGOs have targeted ExxonMobil, criticizing the company for violating human rights and destroying the environment. While no doubt there are many factors involved in the escalating price of gas, Exxon's public relations ploy of deflecting any attention away from Big Oil's role seems to be working. A recent Gallup Poll suggests that, "Ironically, the intensity with which Americans see oil companies as "gas price villains" may be fading a little, according to opinions respondents volunteered in a new Gallup Poll, conducted May 19-21. Over the past year, the percentage of Americans blaming the oil companies for skyrocketing gas prices fell from 34% to 20%; the percentage pointing to oil refinery problems fell from 16% to 9%; and those attributing the increase in prices to problems in the Middle East and the Iraq war fell from 13% to 8%. On the other hand, the percentage of Americans suggesting prices are increasing as a result of the economic forces of supply and demand increased from 10% to 15%, while 6% now point to speculators and 4% to the shrinking value of the dollar and the poor U.S. economy -- both new reasons not even mentioned a year ago. More Americans also mention crude oil prices, the shortage of oil supplies, and U.S. dependency on foreign oil" . ExxonMobil bought unconventional gas producer XTO Energy in 2009 and the companies merged in 2010. By 2012, ExxonMobil was the largest gas producer in the U.S. CEO Rex Tillerson is a vocal support of accessing shale gas through fracking and is against federal regulation of the practice. Tillerson told Fortune that "The assertions that our [fracking] opponents make — why don't you ask them to produce some facts, produce something? I mean, prove it." Exxon's XTO is a funder of Energy in Depth (EID), a pro-oil-and-gas drilling industry front group formed by the American Petroleum Institute, the Independent Petroleum Association of America (IPAA) and dozens of additional industry organizations for the purpose of denouncing legislation proposed by Colorado U.S. Rep. Diana DeGette to regulate underground hydraulic fracturing fluids. Open Secrets reports that during the 2010 campaign season, ExxonMobil gave $1,274,762 to federal candidates: $132,970 to Democrats and $1.13 million to Republicans. Exxon is one of the largest energy company contributors to both Republican and Democratic candidates for Congress. In 2010, ExxonMobil spent $12.5 million on lobbying. You can see a list of current lobbyists working for ExxonMobil HERE. There is also a list of the bills ExxonMobil has lobbied for in the past five years HERE. These contributions total $676,177 to the 110th US Congress (as of the third quarter), the largest of which has been to Rep. John Cornyn (R-TX) for $46,000. Rep. Cornyn, for his part, has consistently voted with the oil industry on energy, war and climate bills. More information on oil industry contributions to Congress can be found at FollowtheOilMoney.org, a project created by the nonpartisan, nonprofit organization Oil Change International. It was reported in July 2013 that Exxon Mobil subsidiary XTO Energy Inc., "signed a consent decree filed in U.S. Middle District Court in which it has agreed to pay a $100,000 Environmental Protection Agency civil penalty" for an llegal discharge of fluids from a Marcellus Shale natural gas well site in Lycoming County, Pennsylvania. The Texas company will also spend "spend $20 million to implement preventive measures and the required recycling and disposal of fluids from hydraulic fracturing and well operations." John Doe I v. ExxonMobil, Case No. 01CV01357 (filed D.D.C. 2001). Plaintiffs in Indonesia allege that they suffered human rights violations at the hands of Indonesian military that was hired by ExxonMobil to provide security for its natural gas facilities. Plaintiffs allege that ExxonMobil hired these troops knowing they would likely engage in massive human rights violations against the local population, and that all of the claims date from 2001, well after ExxonMobil had specific knowledge of massive human rights violations and could have changed their practices. Motion to dismiss is pending. "A Report about the Alien Tort Claims Act" & "U.S./Indonesia: Bush Backtracks on Corporate Responsibility" & "John Doe v. ExxonMobil Corp. Case" & "Doe v. ExxonMobil Corp."
Steve Coll, Private Empire: ExxonMobil and American Power (Allen Lane, 2012). CMD Submits Evidence of ExxonMobil Funding ALEC’s Climate Change Denial to California Attorney General, PR Watch, January 21, 2016. California to investigate whether Exxon Mobil lied about climate-change risks, L.A. Times, January 20, 2016. Exxon Mobil Investigated for Possible Climate Change Lies by New York Attorney General, New York Times, November 6, 2015. Complexxon.org on cheap oil disorder & budget crime:Incorporated governance. Terry Macalister, "Exxon admits greenhouse gas increase", Guardian (UK), October 7, 2004. Lisa Sanders, "Exxon hires Bush energy aide: Figure in global-warming row moves from White House", CBS.MarketWatch.com, June 14, 2005. Andrew C. Revkin, "Former Bush Aide Who Edited Reports Is Hired by Exxon", New York Times, June 15, 2005. "Exxon sticks with hiring older tankers", Sydney Morning Herald, July 2, 2005. Felicity Barringer, "Exxon Mobil Becomes Focus of a Boycott", New York Times, July 12, 2005. Jad Mouawad, "Longtime Chairman of Exxon Mobil to Retire at Year's End", New York Times, August 4, 2005. Chris Mooney, "Some Like It Hot", Mother Jones, May/June 2005. Michael Bush , "Exxon buoys PR amid oil industry backlash", PR Week, February 3, 2006. (Sub req'd). Andrew Buncombe and Stephen Castle, Exxon spends millions to cast doubt on warming, The Independent, 07 December 2006. Terry Macalister, "We have a bit of a PR problem on global warming, ExxonMobil admits", The Guardian, January 9, 2007. Robert F. Kennedy, Jr., "ExxonMobil's War on Science," AlterNet (via HuffingtonPost), January 31, 2007. Julie Sevrens Lyons, "Donor to Stanford: No Big Oil - University Donation Rescinded Over Ad," Mercury News (San Jose, CA), March 11, 2007. Julie Sevrens Lyons, "Big Oil money doesn't go over well down on The Farm: Many at Stanford are upset by university's relationship with ExxonMobil," Mercury News (San Jose, CA), May 23, 2007. Steven Mufson, "At Exxon Meeting, a Storm Outside but Calm Within," Washington Post, May 31, 2007. Michael Erman and Ed Stoddard, "Exxon Investors Put Exec Pay Issue Above Climate," Reuters, May 31, 2007. Dashka Slater, "Resolved: Public Corporations Shall Take Us Seriously," New York Times, August 12, 2007. "Exxon CEO: Settlement with Venezuela could be reached before arbitration concludes," Associated Press, October 15, 2007. Brent Kendall, "Indonesians' Suit Against Exxon Cleared for Trial," Wall Street Journal (sub req'd), August 28, 2008. Tyler Hamilton, "The little car that could boosted by Exxon film," The Toronto Star (Canada), June 24, 2009. ↑ Hoovers, Exxon Mobil Corporation profile, accessed July 8, 2011. ↑ Exxon Mobil CEO’s salary hits $22.4M,"Bizjournals.com." April 13, 2009. ↑ Nick Surgey, "https://www.exposedbycmd.org/2016/07/27/exxonmobil-top-sponsor-alec-annual-meeting/ ExxonMobil Top Sponsor at ALEC Annual Meeting]," Center for Media and Democracy, July 27, 2016. ↑ Lisa Graves, A Lot of White Space: Firms Drop Off ALEC's Meeting Brochure, PRWatch, July 30, 2012. ↑ Nick Surgey, "ALEC Conference Funding Dominated by Big Polluters," Center for Media and Democracy, PR Watch, July 23, 2015. ↑ Center for Media and Democracy, Press Release, October 6, 2016. ↑ "The Politics of Climate Change", Odwyer's Magazine, Feb. 2010. ↑ Exxon again cuts funds for climate change skeptics. Reuters (2008-03-23). Retrieved on 2011-03-31. ↑ "Exxon Announces Cutoff for Warming Skeptics--Again", Integrity in Science, June 2, 2008. ↑ 24.0 24.1 24.2 "Analysing the ‘900 papers supporting climate scepticism’: 9 out of top 10 authors linked to ExxonMobil" The Carbon Brief, April 15, 2011. ↑ "ExxonMobil and XTO complete merger", NHST Media Group (2010-06-25). Retrieved on 2010-06-27. ↑ Andrew Restuccia, "Exxon CEO to ‘fracking’ critics: ‘Prove it,’" The Hill, April 16, 2012. ↑ PAC Summary Data, Open Secrets, accessed October 2007. ↑ Lobbying Information for ExxonMobil, "Open Secrets.org"
↑ ExxonMobil lobbying expenses, Open Secrets, accessed October 2007. ↑ "Problems at Pa. gas well site to cost Texas company big dollars" John Beauge, The Patriot-News, July 19, 2013. ↑ Culter J. Cleveland, "Exxon Valdez Oil Spill", The Encyclopedia of the Earth, April 22, 2008. ↑ Exxon Mobil Key Executives, Yahoo Finance, accessed October 2007. ↑ Board of Directors, ExxonMobil, accessed August 2007. This page was last edited on 27 December 2018, at 18:52.